Class-Leading Safety Design of the 2019 Ram Pickup Truck | South 20 Dodge Chrysler Ltd. 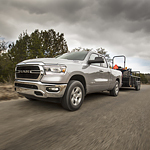 Whether you're navigating a busy urban highway or a rugged road in a remote area, the 2019 Ram 1500 gives you lots of confidence behind the steering wheel. This light-duty pickup truck includes more than a dozen features that boost handling in normal and hazardous situations. The Rain Brake Support reduces the accumulation of moisture on the brake pads and calipers. This technology is supplement by the Ready-Alert Braking that responds to a sudden change in the vehicle's speed. For example, you'll get panic-type braking support when there's a need to suddenly slow down on the road. The 2019 Ram 1500 also has the Hill Start Assist, which works in tandem with the automatic transmission system. This technology makes sure that the gear ratio matches the intended uphill direction of the car. The Hill Start Assist function is active only when you're parked at a grade of 8.0 on the slope scale.